Long before ‘Mickey’s Polo Team’ (1936) or Walt Disney took on playing polo himself, the Van Beuren studio visited the game in the silent short ‘Polo Match’. The cartoon stars a couple of mice, with the hero being indistinguishable from the others. The mouse plays a polo game with the others on mechanical horses, and most of the gags (even the final one) stem from the horses falling apart. Meanwhile the hero’s sweetheart is harassed and later kidnapped by a mean old cat. Our hero pursuits the cat and saves his sweetheart. The cartoon is pretty fast and full of action, but none of the gags are interesting enough to keep the viewer’s attention. Nevertheless, the short was re-released in 1932 as ‘Happy Polo’, with an added soundtrack. It’s pretty likely that the inspiration for the mechanical horses stems from the Oswald the Lucky Rabbit cartoon ‘Ozzie of the Mounted‘ (1928) in which Oswald rides a mechanical horse himself. In any case, mechanical horses were clearly much easier to animate than real ones, and one was reused in ‘Hot Tamale’ (1930). ‘Toy Time’ is another typical Silly Symphony-like short by Van Beuren, trying to beat Disney at his own game. 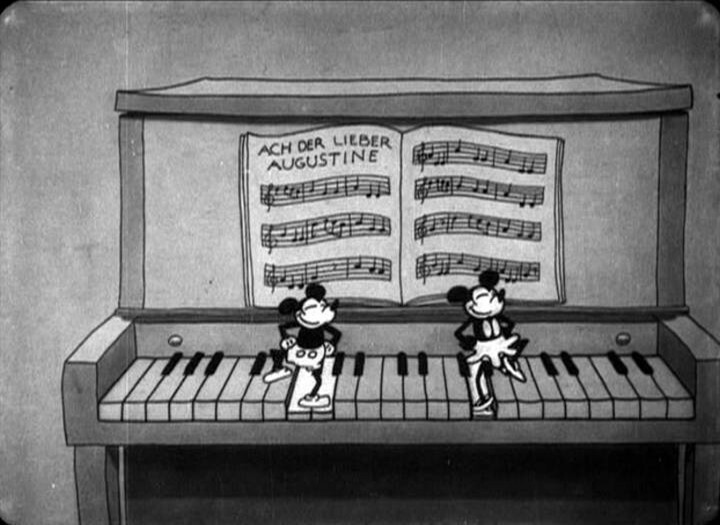 The cartoon features two mice, Oscar and his girlfriend, who resemble Mickey and Minnie less than Van Beuren’s ill-fated stars Milton and Rita had done (see e.g. ‘Circus Capers‘ and ‘The Office Boy‘). In fact, the two are portrayed as real mice, having fun in the toy shop at night. This premise comes directly from the Silly Symphony ‘Midnight in a Toy Shop‘, but the Van Beuren studio adds some drama, when a cat appears, and the two mice battle him with help of several toys. Strangely enough the cartoon doesn’t end at that point, but also features a scene in which Oscar serenades his girlfriend on the piano. Only then he earns his sweetheart’s kiss. Like ‘The Family Shoe‘ (1931), ‘Toy Time’ is highly ambitious. For example, it features a splendid score by Gene Rodemich, and elaborate and quite beautifully painted backgrounds. Unfortunately, the animation is still pretty awkward, and the designs of the two mice primitive and bland. Nevertheless, it shows that the Van Beuren Studio was trying very hard. Four months later, Warner Bros. would cover similar grounds in ‘It’s Got Me Again!‘, but with much more satisfying results. 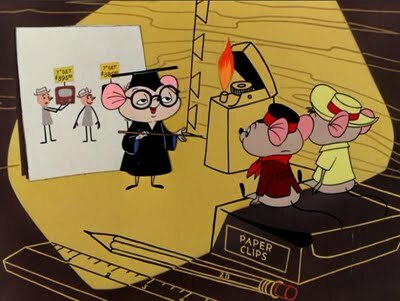 ‘The Rescuers’ was a joint venture of an old and a new generation of animators at the Disney studio. It is without doubt the best of the three features the studio made in the seventies. It was Disney’s first feature film since ‘One Hundred and One Dalmatians’ in which Wolfgang Reitherman shared the direction duties, and this fact alone arguably improves the end product. Unlike the earlier features ‘The Aristocats’ (1970) and ‘Robin Hood‘ (1973) it doesn’t contain any reused animation (with a possible exception of animation from ‘Bambi‘ in a minor mood scene). And while ‘The Aristocats’ and ‘Robin Hood’ relied on proven formulas, both being very reminiscent of ‘Jungle Book’ (1967), ‘The Rescuers’ has a fresh story (based on a children’s book by Margery Sharp), and a unique, surprisingly gloomy atmosphere. In Sharp’s book the mice rescue a prisoner, but for the film the Disney story men chose an orphan girl named Penny to be rescued. A masterstroke, for the lovable little girl easily becomes the center of the story, which contains a lot of heart. 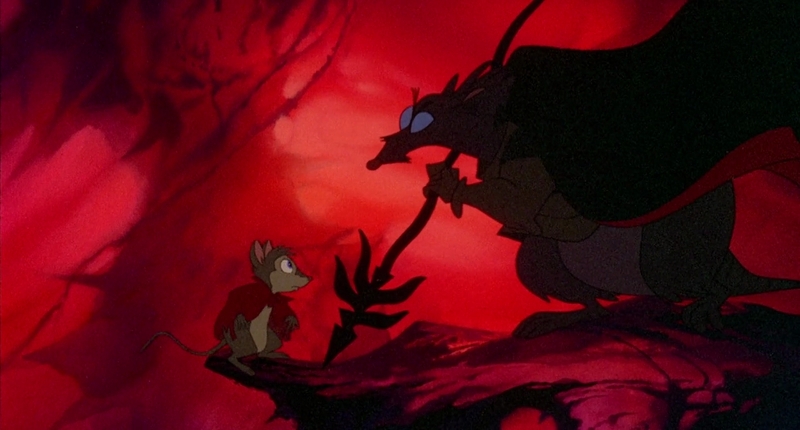 However, all the film’s main characters are adorable: the lovely Hungarian mouse Bianca (voiced by Eva Gabor) and her companion, the superstitious yet valiant janitor Bernard are such great characters that they were able to spawn Disney’s first sequel, ‘The Rescuers Down Under’ in 1990. Medusa is a real and wonderful villain. She hasn’t got any special powers and at times she’s portrayed as preposterous, but mostly she’s sly, mean and genuinely scary: a worthy adversary for our heroes to deal with. 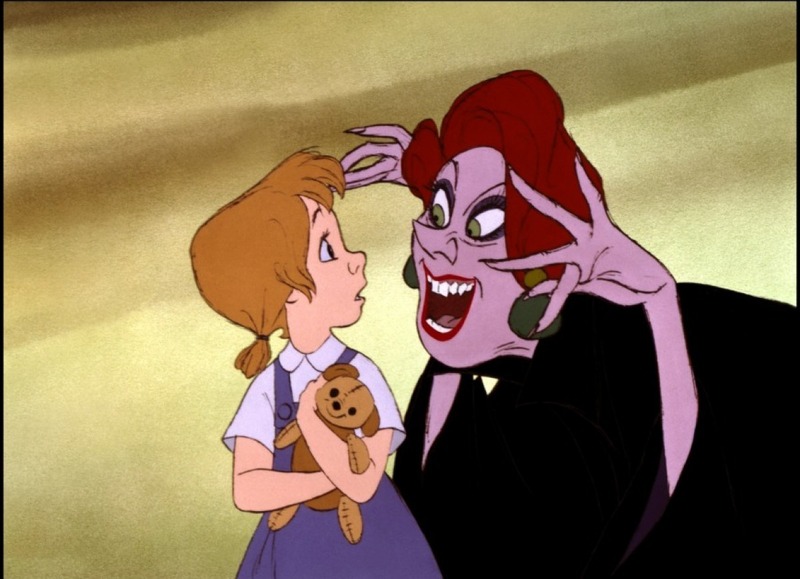 She was animated by Milt Kahl, the last and arguably best piece of animation he ever did for the studio. Medusa may steal the show, but even the minor characters like Orville the Albatross, Rufus the cat, Evenrude the damselfly, Snoops and the two Alligators are delightful. They all contribute to a story, which is concise and well-told. It evolves without delays or side-ways, and leads to a great finale in Devil’s Bayou. ‘The Rescuers’ is also the first Disney feature since ‘Bambi’ (1942) not to be a musical, but to use songs to evoke moods only. All these elements contribute to a story which is both thrilling and moving. The film’s opening credits use a song and beautiful oil paintings by Mel Shaw to start the story. Unfortunately, the background paintings in the rest of the movie are more prosaic, mixing moody oil paintings with more graphic backgrounds to an uneven effect. The animation on the other hand is superb throughout. Unfortunately, ‘The Rescuers’ proved more of a swansong of the old generation of nine old men than the beginning of a new era. The following features were much weaker, and only with ‘The Little Mermaid’ (1989) Disney found a genuinely new and strong voice. Thus stands ‘The Rescuers’ as a beacon of light in the dark ages of animation that were the 1970s and 1980s. Chuck Jones was the only director to pair Porky Pig with Sylvester. His Sylvester is very different from the one in Freleng’s Tweety cartoons. In Jones’s shorts he’s a cowardly cat that cannot speak. 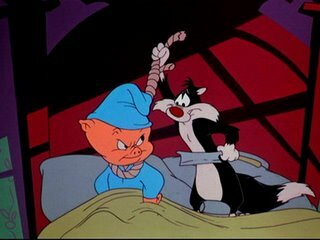 In all Porky-Sylvester cartoons Porky tries to stay asleep unaware of the real dangers around him. Sylvester, on the other hand, sees them all, but fails completely in convincing his master of the dangers. The aptly titled ‘Sacredy Cat’ was the first of a series of three. In this cartoon Porky and his cat Sylvester enter their new mansion, which has genuine horror allure, scaring Sylvester to death. And for a good reason, because this mansion is inhabited by homocidal Hubie and Bertie-like mice who make several attempts to murder Sylvester and Porky. Only when Porky discovers the mice, too, who lead him to a certain death, Sylvester rediscovers his courage and chases all the mice out of the house, except for the headsman mouse, who knocks the cat down, and reveals to be a caricature of comedian Lew Lehr (1895-1950), exclaiming a twist on the comedian’s catchphrase: “pussycats is the craziest people!”. An odd ending to a sometimes rather unsettling cartoon. Porky and Sylvester would reunite six years later in an all too similar cartoon called ‘Claws for Alarm’ (1954), and again in ‘Jumpin’ Jupiter‘ (1955). Awkwardly, in this sixth Mickey Mouse cartoon Mickey and Minnie are portraited as real mice. They are joined by several look-a-likes in a house party, while the owner, a drunk cat, is gone hunting. There’s still some silent comedy (and no dialogue), but there’s no real story, only an extended musical number. Therefore this cartoon can be regarded as the first of many ‘song-and-dance-routine’-cartoons that would dominate the early 1930s. It even predates the Silly Symphony series, which initial sole raison d’être seems to be song-and-dance-routines. These cartoons no doubt delighted the audiences at the time. However, I regret their coming, because both story and surreal humor had to give way to the rise of them. ‘When the Cat’s Away’ is a prime example: despite some clever gags, it is easily the dullest of the earliest Mickey Mouse cartoons. After ‘When the Cat’s Away’ Mickey would never been portrayed as a real mouse again. Like in his first five cartoons, he would just be a boy in the shape of a mouse. The idea of Mickey being a mouse would become negligible compared to the cartoon star he was. Mickey was seen as an actor, not as an animal. This would eventually lead to the awkward situation of Mickey dealing with ‘real’ and very different looking mice in ‘The Worm Turns‘ (1937).